Suggestion for use: ideal for dressing bread, seasons vegetables and beef carpaccio. Make a tartar of beef fillet (80gr of Chianina beef), dress with some extra virgin olive oil, salt, pepper and lemon. Wrap with clear cling film and store. For the peat egg sauce use: 2 whole eggs, 500ml pasteurised egg, 100ml cream, 200ml milk, 3 handfuls of parmesan cheese, salt and pepper. Mix together all the ingredients, cook in an oven at 80° and at the end, add the Laphroaig (a peat liquor). For the parmesan ice cream, boil 1lt milk, 330gr cream, 30gr glucose syrup, 40gr invert sugar, 5gr stabiliser for ice cream, dissolved in the sugar, 1 gelatine leaf and 200gr parmesan. For the parmesan froth use: half clove garlic, 400gr cream and salt (as desired). Reduce the liquid, then purée, together with 50gr parmesan and 500ml cream. Put into a gourmet whip with 2 gas capsules. Store in refrigerator. Dress the tartare, cutting together with extra virgin olive oil, pepper and Maldon salt, grating the black truffle on top and adding a line of white truffle. For garnish, put the peat egg around the tartar, add some red sprouts, wild herbs, parsley sauce (broiled parsley, that is chilled with ice and beat together with oil, a few pine nuts and anchovies, salt, garlic; then whip together with xanthan thickener. On top of the tartare, place an amount of the ice cream, then put the froth around this adding the white truffle at the end. Use a soup plate. For the finishing touch, add the oil ‘Borgiona’. 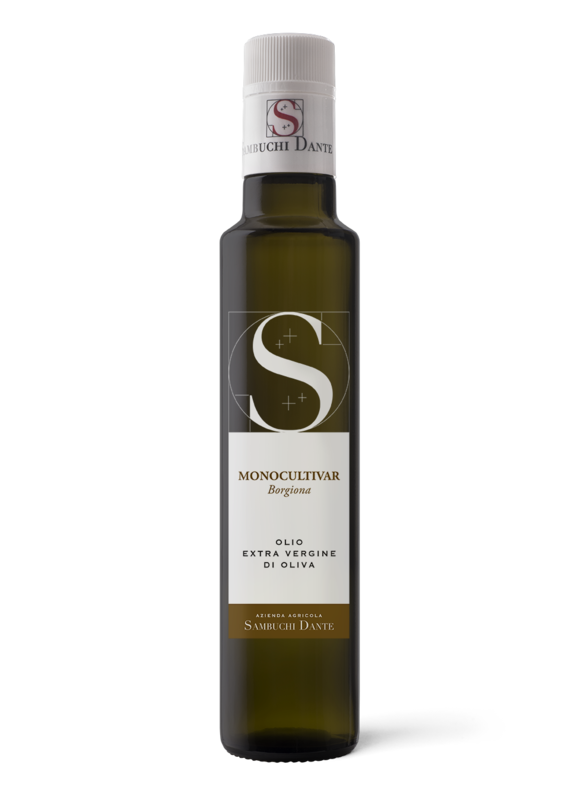 They are five splendid oils with different characteristics; perfect ingredients for a cuisine of both meat and fish “earth and sea” capable of exacting the raw materials. This is the reason way I chose the olive oils of Azienda Dante Sambuchi, devoted lover of quality and wellness.